I just wanted to say thank you, everyone at the group reading had an amazing night. And thank you for my daughter’s reading, she was the last one read, you told her about her grandmother’s card and that her grandmother sees her kissing it. Feeling very blessed right now. And I will be letting you know when I’ll be doing this again. You have a gift, a wonderful gift. Thank you for sharing it! Gina, I am very grateful to you for your patience and for teaching me that the other side is a peaceful place where love and forgiveness reign. You have taken away the desperation I felt when I came to see you first, helped me to understand how I can keep in touch with my husband and given me hope for the future and I thank you for it. Wow, had a fantastic reading with this beautiful lady whilst visiting friends in New York. Gina, you have given me a great peace of mind & for that, I thank-you. Spot on & you really made me feel as if my mother & father were right there with me. I do believe they walk with me every day. Gina, thank you so much for the excellent readings you gave to both Laura and Margie…they are still raving about you to me! I have had the pleasure of being read by Gina in a group setting and on a one on one basis. Both readings left me blown away by the insight and accuracy she provided. Gina gives a reading that not only includes personal and healing messaes from loved ones, but also includes insight into what you might need to hear in order to move forward in your own life. She uses the perfect blend of mediumship and psychic ability. Thank you Gina!! I believe it was fate I met Gina. Before I did, I was just starting to become spiritual, not knowing if I was on the right path. Gina helped me to trust my instincts, and uncover my souls path in this lifetime. When I walked into the room, I felt her positive, healing energy immediately which made me feel at ease. She then described thoughts and feelings I have, and haven’t been able to put into words! She kept me focused, not forgetting why I’m here and what I’m supposed to achieve and focus on. 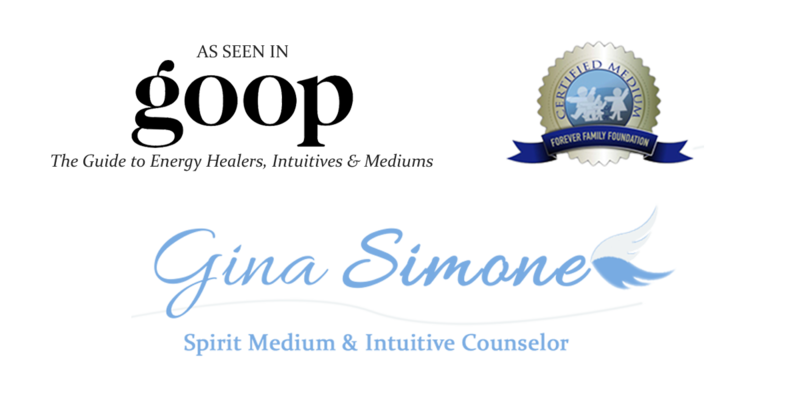 Go see Gina, she will help you communicate with your family and your spirit guides, understand your soul’s mission, and put your mind at ease! Gina….Thank you so much for the amazing reading you gave me! You gave me so much credible and incredible detailed information. You confirmed many things that I was thinking about but you also shared guidance on many things that I didn’t know and really needed to hear about. The best part of your readings is that you come from a place of pure love, you have no ego attachment and you have a genuine desire to help people. You are very warm and loving and your readings are very compassionate. You will be hearing from me again. Thank you, thank you, thank you!! Gina…..From the moment I met you, I knew you were a very special person. I came to you for a Psychic reading session. The session was an amazing experience. As I arrived at your door I had just made the decision to focus this session on my career and lo and behold… You were guided to focus on my career…awesome… we were in alignment. The session touched my soul AND as I compose this e-mail I can still feel the good tears of KNOWING that what you were saying is my TRUTH and you knew it. You could SEE what I had only imagined. The session solidified my commitment to move out of my fear and into the future that I have seen for myself. It gave me the tools to focus and believe and manifest. It gave me the confidence and determination to commit myself to achieving my goal.The CD that you gave me to ground, focus and manifest my destiny is amazing… I listen to it constantly…and now, I can tell you that all the baby steps that I started to take are manifesting on the physical plane…the “office space” is now under construction. There isn’t a day that goes by that I don’t replay our session or listen to the CD and receive inspiration and guidance. I can’t wait till our next session. Hi Gina, I met you at Pat Longo’s event in Plainview. During her break, when you were reading, my mom clearly came through and you were amazing. Through you she spoke about details of her illness and her passing that were so specific and unmistakable that she was right there with us. It was only a few months after she had passed and, that night at Pat’s, your reading helped me so much to know that our loved ones never die. I left that night with a smile, and for the first time, with peace in my heart knowing my mother was not only still alive in Spirit but ok after her long painful battle with lung cancer. Thank you for that night, and for helping my mother connect with me and for the peace your gift gave me. God Bless you. Gina, I met with you this past Saturday. I just wanted to thank you for a wonderful reading, and I’m so happy it was with you. A lot of things I really needed to hear. Your are a treasure and a gem sent from God and a beautiful person. My mom was crying when I told her everything you shard with me and she wants to see you herself for an appointment, as does my brother. I just wanted to say thank you for my reading, and for donating the raffle basket at the Spiritual Awareness Seminar, that I won, otherwise I would have never got a reading. I had a Skype reading with Gina a few weeks ago which blew me away. She was spot on with what she said my family members who had crossed over had said, along with other people as well. She mentioned my twin brother who had died at birth 74 years ago who most people don’t even know existed. She talked about my sister apologizing after years of verbal abuse when she was alive. Gina basically covered the past, present & future during our hour long visit, while concentrating on the most meaningful messages I needed to hear from whoever it was. Gina is truly the real deal. A reading from her is one of the best presents you can give yourself or someone you love. You won’t regret it…I promise…. Gina, I wanted to thank you for the amazing reading you gave me. The comfort as well as the validation of my feelings were priceless to me. I did want to share with you one thing. You had asked me “they’re showing me a J initial that is very special”. Having so many people in my life with the J initial, my mind went blank as to who it could be. When I got into the car, I looked at the paper you handed me with all your notes on it. I was shocked to see the 2 words, JEWLERY & SPECIAL. I almost fell off the seat. I was wearing a necklace with a “J” during the reading. My mother had given that to me for my 21st birthday. I always remember how proud she was that she bought it with her own money (she had just gone back to working) and how much nicer it was than most initial necklaces available at that time. I had worn it especially for the reading and totally forgot I had it on…DUHH! Thank you for my reading and for donating your time to Last Hope Animal Rescue.